Connected vehicle (CV) technology uses vehicle-to-vehicle and vehicle-to-infrastructure wireless communication to exchange information among vehicles, traffic control systems, and mobile devices. Transportation managers will use connected vehicle data in a range of applications that result in more efficient traffic flow, enhanced safety, improved fuel efficiency, and reduced emissions. The engineers who are developing CV applications need a reliable, standardized way to test those technologies under a wide range of simulated conditions. The Federal Highway Administration (FHWA) Exploratory Advanced Research (EAR) Program is supporting research that incorporates actual vehicle performance data into modeling and simulation platforms to accelerate the ability to study and assess complex CV and vehicle automation systems. Researchers at Texas A&M University Transportation Institute (TTI) are working with partners at Battelle Memorial Institute and Siemens Corporation on a project called “New Approaches for Testing Connected Highway and Vehicle Systems.” The goal of this EAR Program-sponsored project is to develop a simulation environment that incorporates data from real entities—a connected vehicle and signals in a roadway network—into a simulation. At the University of Michigan and the University of Minnesota, EAR Program-supported researchers have developed an in-the-loop system that transmits CV simulation data to a laboratory-housed engine and dynamometer. The project, “Building a Hardware-in-the-Loop Simulation Testbed,” links an actual powertrain with vehicle and traffic simulations to measure fuel consumption and emissions under varying CV scenarios. CV technology will make it possible for cars, other vehicles, roadway signals, other infrastructure, smartphones, and other wireless devices to "talk" to each other. The CV environment will capture and exchange data from vehicle-to-vehicle communication devices located on cars, trucks, and buses to vehicle-to-infrastructure components such as traffic signals, cameras, and speed-monitoring equipment. The data-rich CV conversation will provide drivers and automated vehicle systems with information that enhances safety and gives traffic managers information that will help improve mobility, shorten travel time, and reduce the environmental impact of highway traffic. © 2016 Texas A&M Transportation Institute. Data from an actual vehicle is incorporated into a simulation that displays interaction of actual and virtual connected vehicles and infrastructure. Traffic simulation software allows researchers to describe specific traffic elements, such as individual vehicle speed, traffic volume, road conditions, and signal timing, at every step in a period of simulated traffic flow. The simulation responds to a change in any element—introducing a different traffic signal phasing, for example—by showing the impact of the change on all other simulated elements. Existing simulation software represents a safe and reliable environment for testing virtual traffic elements. EAR Program-supported researchers at TTI demonstrated a simulation platform that effectively incorporates actual CV information. 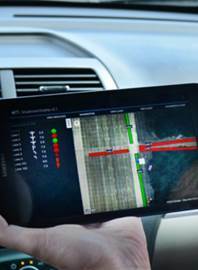 The simulation platform, called CONVAS (connectedvehicleassessmentsimulation), merges features of a conventional traffic simulation called Vissim with features of ns-3, an open source wireless communication simulation. The CONVAS platform also includes novel “hardware-in-the-loop” features that feed data from the roadway infrastructure and a connected vehicle into the model. 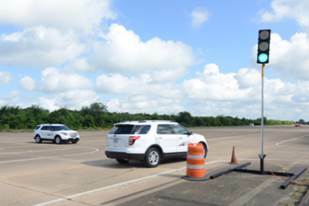 CONVAS integrates data from actual operating roadway elements (at a TTI highway test facility and at the Turner-Fairbank Highway Research Center’s Connected Vehicle Testbed) and displays a simulation that represents how a mix of real and simulated elements communicates and interacts in real time. CONVAS can model interactions for a vast range of CV scenarios, including disruptions in wireless communications, which are essential to connected vehicle technologies. Data from actual connected vehicles and traffic signals on a test track can be incorporated into complex connected vehicle simulations. CV technology will support fuel efficiency, improve air quality, and reduce greenhouse gas emissions by providing real-time data on traffic patterns, alternate routes, and vehicle performance. Simulations require realistic modeling of vehicle fuel economy and emissions in complex and changing traffic situations, but gathering accurate information about these parameters is difficult—equipping multiple test vehicles with large precision measurement devices is complicated and prohibitively expensive. EAR Program-funded researchers at the University of Minnesota (working with colleagues at the University of Michigan) have developed a hardware-in-the-loop feature that incorporates a real engine into a simulated CV environment. The system includes a 115 HP turbocharged diesel engine and an actual hydrostatic dynamometer that controls engine load and output to a virtual powertrain model. A Vissim traffic simulation transmits road and traffic condition information and vehicle-specific performance data over the Internet to the laboratory-housed hardware testbed, which precisely measures actual emissions and fuel consumption. For more information about hardware-in-the-loop simulation research projects, contact Peter Huang at 202-493-3484 (email: peter.huang@dot.gov). The EAR Program addresses the need for longer term, higher risk research with the potential for transformative improvements to transportation systems—improvements in planning, building, renewing, and operating safe, congestion-free, and environmentally sound transportation facilities. The EAR Program seeks to leverage advances in science and engineering that could lead to breakthroughs for critical, current, and emerging issues in highway transportation—where there is a community of experts from different disciplines who likely have the talent and interest in researching solutions and who likely would not do so without EAR Program funding. To learn more about the EAR Program, visit www.fhwa.dot.gov/advancedresearch. The Web site features information on research solicitations, updates on ongoing research, links to published materials, summaries of past EAR Program events, and details on upcoming events.